There are around 1600 drinking fountains spread around the various neighbourhoods of Barcelona, some modern, some old. The one on the corner of Portaferrissa and La Rambla is accompanied by a beautiful tiled mural depicting groups of people at the bottom of the city walls (which are no longer there), together with the protective figure of Saint Josep Oriol flying over the city’s entrance gate. This public wall fountain was built using stone from Montjuïc and ceramic tiles. 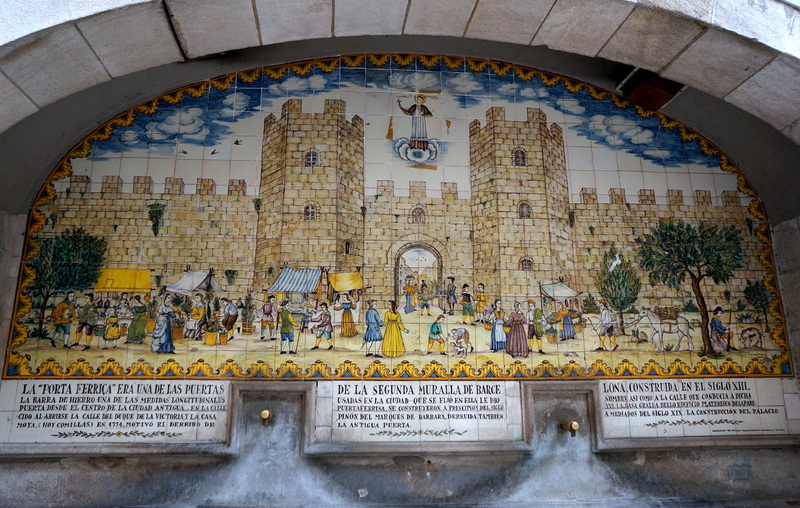 The fountain dates from 1680 and it is not known who built it; the mural tiles date from 1959 and are the work of ceramicist Joan Baptista Guivernau. The fountain owes its name to one of the gates of the second city wall of Barcelona, the ‘porta Ferriça’, at the bottom of which a fountain was placed to supply homes with drinking water. Fantastic tile work. It’s good that traditional crafts are kept alive and relevant. Barcelona is a city of wonders that constantly dazzles the eye. Thanks for contributing to this week’s Monday Mural. Wonderful tilework! And we rarely see a water fountain here these days. We are hard pressed to even find a drinking fountain, never mind one as beautifully decorated as this!